Lyse og luftige 2-værelses lejlighed i udkanten af ​​den historiske "hvide" landsby Frigiliana, stemte den "smukkeste landsby i Andalusien" af den spanske turist myndighed. Sandstrande kun 6 km væk og vidunderlige vandreture land, rig på dyreliv, hele vejen rundt. Lejligheden er beliggende i en lille boligblok på en rolig sidegade og har en spektakulær udsigt - mod øst over Rio Higueron og forrevne bjerge i Tejeda, Almijara & Alhama naturparken, og mod syd til den lille badeby Nerja og Middelhavet. Sovepladser 3, i et dobbelt og et enkelt soveværelse (plus barneseng og / eller sammenklappelig seng til ekstra barn om nødvendigt). Har aircondition / centralvarme. Noter om indkvartering: Lejligheden har aircondition / varme, men også loft fans til dem, som os, der ikke kan lide aircondition. Uden for: Fælles pool (til brug for beboere og deres gæster) er åben i sommermånederne, fra 1. juni til 30. september. Allokeret plads i privat parkeringsplads. Rengøring / Towels / Linen: Håndklæder og linned inkluderet. Andre: Balkon med lille bord og 4 stole, 2 liggestole. Tre sammenklappelige pool-side stole. Mit Hilfe der sehr ausführlichen Informationen fanden wir problemlos zu der Ferienwohnung und auch gleich einen Parkplatz. Die Wohnung ist schön möbliert und sehr gut ausgestattet. Lediglich das Geschirr war nicht wirklich sauber. Die Aussicht vom Balkon ist traumhaft. Wonderful views from balcony. Clean well equipped apartment, everything we needed was there. Beautiful village of Frigiliana easy to explore. Wir hatten eine tolle Woche in Frigiliana!! Es war alles wie beschrieben. Der Ausblick war grandios!! In der Küche war alles da, bis auf eine spanische Espressomaschine für den Herd, was uns gewundert und auch gefehlt hat. Dafür gab es aber eine Frenchpress für die morgendliche Kaffeezubereitung. Die Matratzen hätten für uns gern etwas weicher sein können. Frgiliana ist ein schönes sauberes spanisches Bergdorf ( es hat auch schon einen Preis als schönstes Dorf von Andalousien bekommen ), aber es kommen viele Touristen. Allerdings im Dezember war es wohl eher ruhig. Abends wurde es doch recht schnell kühl und wir mussten heizen, was auch alles gut geklappt hat. Wir mussten nicht frieren. Es gibt Wandermöglichkeiten direkt vom Ort aus. Viele Bars und Restaurants, jetzt allerdings waren nicht alle geöffnet und wir mögen auch gern selbst kochen. Es gibt mehrere gute Einkaufsmöglichkeiten und einen tollen Markt. Die Betreuung war sehr gut! Vor Ort und auch von Anne. Frigiliana is a very picturesque village with lovely views of mountains, nerja and the sea and over the roof tops of the village itself. Lots of day visitors. We stayed for 9 nights which was a bit too long for us as not alot to do in the village but there are lots of places to eat and walk around the lovely streets and alleyways. Too much dog poo on streets though which should be addressed if it's to remain he prettiest village. welcomed by Anne's Spanish neighbour Isobel who despite very little English showed us the ropes. On opening the front door we found a lovely clean apartment. 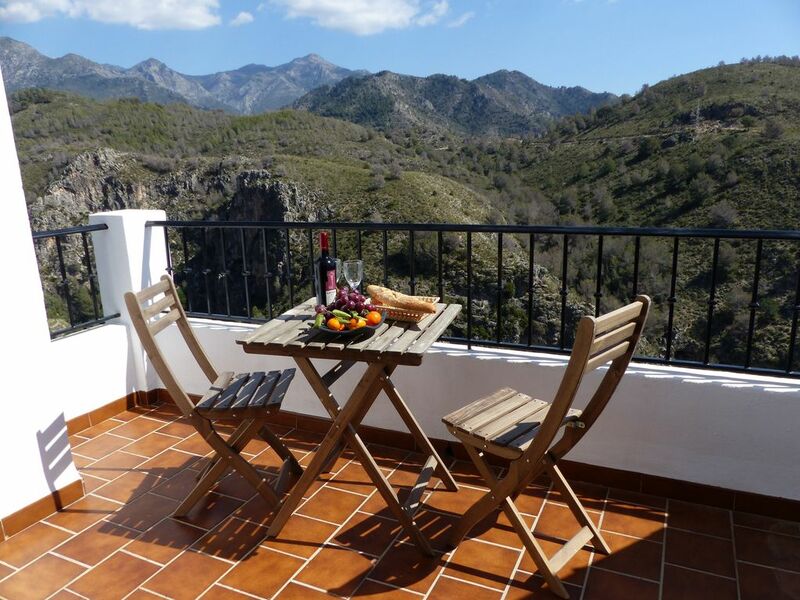 we moved to the balcony opening the curtains finding a stunning view of the mountains and views down Nerja and the sea breathtaking. The pool area underneath the balcony was always clean as was the pool. The sun shines on the pool area nearly all day, and we were often the only ones using it .The kitchen was well equipt don't be put off by a table top oven, it was the best we have ever used good enough to do a roast. The beds were lovely to sleep in no noise from the road despite been next to it. private parking under the pool is a godsend. the living room/dinning area is large with plenty of room. we have stayed in Nerja many times but now we love Frigliana, Nerja is such a pain /expensive to park if staying full time. we did visit Nerja during the day and at night and is still a great place to visit not loud but has a good buzz in the old town and Balcon area. we visited Malaga and the large market at Almunecar on Friday. found the food shops in Frigiliana very reasonable and the fresh bread and cakes wonderful. we stayed during the three cultures festival which we enjoyed all the stalls all over the village with a big tapas trail. The closing fireworks and laser show were spectacular (you tube) it was busy but made for a great atmosphere. we very much enjoyed our time at this apartment and would definitely stay again. Anne was always prompt with replies and sends a lot of information. Sarah and Steve who look after it for Anne are a great team you can always get hold of them if required. Thanks for a lovely time. 10 minutters kørsel til Nerja, som har flere dejlige strande for enhver smag. Videre langs kysten mod øst finder du en række smukke øde strande, selvom nogle involverer lidt af en gåtur fra vejen. Ca. 50 minutters kørsel fra Malaga lufthavn. Bil nyttigt, men ikke afgørende, da der er regelmæssige busforbindelser mellem Malaga og Nerja (1 til 1. 5 timer) og mellem Nerja og Frigiliana. 6 km til Nerja, hvor du kan finde restauranter, supermarkeder, fabelagtige huler og dejlige strande. Nærliggende landsbyer er værd at besøge er Competa (26 km), Torrox pueblo (13 km) og Acebuchal (7 km). Dagture er mulige til Malaga (60 km) eller Granada (100 km), og hvis du har mere tid, du kan besøge smukke Ronda (160 km), Cordoba (210 km) eller Sevilla (260). Der er masser af små butikker, barer og restauranter i landsbyen, herunder flere kun et stenkast fra lejligheden. Der er også flere banker og et ugentligt marked. Det er en behagelig 10 minutter spadseretur fra lejligheden til den smukke gamle by. Nerja har en bredere vifte af faciliteter, herunder supermarkeder og flere dejlige strande. Det bjergrige Tejeda, Almijara & Alhama naturparken, hvis stier kan tilgås fra landsbyen, giver fremragende vandreture land og en bred vifte af dyreliv, af særlig interesse for fugleinteresserede. Notes on prices: Payment only in £ (GB pounds) sterling. Reductions are available, on enquiry, for bookings of 3 weeks or more. Hire of cot and/or high chair: £14 per week each. Use of folding bed: £10 per week (to cover extra laundry) Booking Notes: 25% non-refundable deposit payable on booking. Balance and a £100 security/breakage deposit due 6 weeks before your arrival. The security/breakage deposit will be returned within 2 weeks of the end of your stay, provided the keys have been returned and no damage or missing items reported. We regret that no refunds will be given (except for the security/breakage deposit) if cancellation occurs within 4 weeks of your booked date of arrival, unless the apartment can be re-let. Changeover Day: Changeover day is flexible, The apartment is generally available from 15.00 hrs on your arrival through to 10.00 hrs on departure day, but we may be able to accommodate earlier arrivals and/or later departures on enquiry.